In the early 1990s I was canoeing with my parents in the marsh on Upper Klamath Lake in southern Oregon. I was pointing out the various landscapes I had known since childhood: Pelican Butte, Bare Island, Modoc Point, Highway 97.... The mention of this last one triggered my mother's memory and she told a family story I had never heard. For all of his adult life, my father worked for U.S. Bank, from rolling coins as a teenager in Medford to his retirement as Asst. Vice President. In the 1950s and 60s, he was a trust officer and regularly traveled the backroads of southern Oregon from one branch to the next. The bank provided a shiny-new brown car for his travels. To this day I can wander into a rural branch and there's a good chance someone will say, "You're Shirrel Doty's son? He hired me years ago!" I never have a problem cashing a check. In 1954, Congress passed the Klamath Termination Act, a bill which authorized the sale of native lands and established procedures for terminating all federal relationships with the Klamath Tribes. Over 1600 tribal members agreed to lump-sum payments of $43,000 each for their tribal land, and U.S. Bank was named trustee of the Klamath estate. The "wisdom" of the Termination Act is matter for another story, one told well by Rick Steber in his novel, Buy the Chief a Cadillac. At first, U.S. Bank said no way. They didn't want any part of it. But the federal government reminded them that they were a federal bank and didn't have a choice. U.S. Bank reluctantly agreed. The Klamaths insisted on cash only -- no checks! They hadn't had good luck in the past with pieces of paper signed by representatives of the government, and so U.S. Bank opened a branch in Chiloquin to distribute the money -- a LOT of money. The first trick was how to get the cash from the bank's main branch in Portland to their Klamath Falls branch and then to Chiloquin. The use of armored vehicles was dismissed. The trip was long and offered too many possibilities for things to go wrong. So they decided to mail the cash -- all of it -- through the U.S. Postal Service. I kid you not! Knowing the territory, my father was chosen to drive the cash the 30 miles along Highway 97 between Klamath Falls and Chiloquin, twice a day for two weeks. Though he was escorted by armed federal cops and state troopers in unmarked cars, in the end it was just him in his brown bank car with the cash in his briefcase in the trunk. My mother was worried sick. 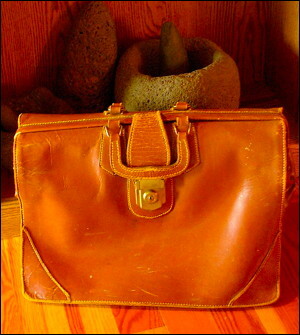 Years later, as I headed off to college, I grabbed the old leather briefcase and used it to lug textbooks and stories and music from class to class, not knowing its history until my mother told the story while we were floating in a canoe in Upper Klamath Lake. Now the briefcase has a cozy place in my home next to my first non-electric Olympia typewriter. By itself it's just another beat-up briefcase but stick a story inside and it comes to life.